We carry a wide array of frames in style to meet every need and every budget. We have complete lens and frame programs for the budget minded and offer the latest in designer brands. Our experienced frame stylists will make sure you get the look you desire, from traditional to contemporary to just plain fun. We have a computer program that allows you to compare 4 different frames on your face at the same time, making it easier to make a decision. It is also fantastic for those with poor vision who were never able to see themselves in a frame from a normal distance. We will gladly custom order a frame, or give us your frame and we will make your lenses using the highest quality. Either way, you have our 100% satisfaction guarantee. Designing attractive eyeglasses takes many factors into consideration. Our experienced staff has 125 years in the optical field and know what questions to ask to determine your specific desires. They what shapes will look the best on your face. They know will help you determine what frame shape and size will best fit your prescription to give you the lighted, thinnest, most attractive pair of glasses ever. For success and satisfaction, proper measurement and selection of eyewear are as critical as the correct prescription, determined by the doctor. Skowron Eye Care offers all this at prices below that of the major chains. Plastic lenses: These le nses are the lightest, thinnest, most attractive. The weight is half that of glass, but they scratch a bit more easily. Scratch-resistant coating protects plastic lenses during everyday use. Plastic lenses are prescribed about 95% of the time. You may have seen these advertised as "Featherweight". This extra thin and light material is used for higher prescriptions and rimless frames. Our frame stylists will help you choose the right frame to ensure that "coke bottle" look is a thing of the past. We will design a set of eyewear for you that will look fabulous. We guarantee it. This type of plastic is UNBREAKABLE. For safety reasons, we prescribe them for children and for sports goggles. Glass offers scratch resistance but is twice the weight of plastic. If dropped, these lenses can break. Hardly used anymore. Transitions Lenses: These lenses change from light to dark when you go outdoors. The names you have heard are either Transitions or Sun sensor. You can get gray or brown tints. Outdoors the lenses get about 90-95% as dark as prescription sunglasses. They take about 90 seconds to completely lighten up indoors (no residual tint). These lenses have improved greatly so from those of the past. They begin to lose their "changing" ability in about 3-4 years; they don't darken or lighten as much. Single-vision lenses contain one prescription throughout for people who are nearsighted or farsighted, have astigmatism, or need reading glasses. The prescription ground in the lens corrects both near and distance vision. Depending on your age, the midrange distance between 3ft and 10ft may be blurred. The lined bifocal offers a larger reading area. The prescription in the lens corrects for distance, midrange (computer), and reading. These lenses are used for people needing to see often at 3-6 feet. Focusing occurs at many different levels: distance, midrange, close, and distances in between. Power changes gradually as one looks down through the lens. The reading area is much smaller than lined bifocals. To work properly, it is imperative that these are measured and fit by a skilled technician. There are many different "brands," some causing more peripheral distortion than others. We only use the best. Reading requires moving the head rather than the eyes from side to side. There is more initial peripheral distortion when reading. These lenses are not advised for people who suffer from motion sickness (can't read in a moving car). All bifocals take some getting used to, but we feel these are eventually the most natural. They are popular because the lineless is cosmetically appealing. It will probably take you a couple of weeks to a month to adjust to your new lenses. Don't look at your feet when walking. Hold reading material closer to your body and lower your eyes so that you are reading out of the lowest part of your lenses. Fold your newspaper in half or quarters and move it rather than your head when reading. Wearing them as much as you can for the first couple of weeks, will speed up the adjustment period. The gradual decrease in the ability of the eye to focus at near objects is a natural part of the aging process called PRESBYOPIA. Multifocals can correct for these changes. 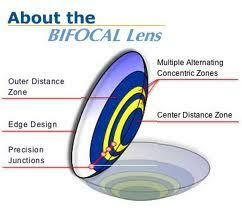 Currently, multifocal lenses account for more than half of all lenses worn in the US. 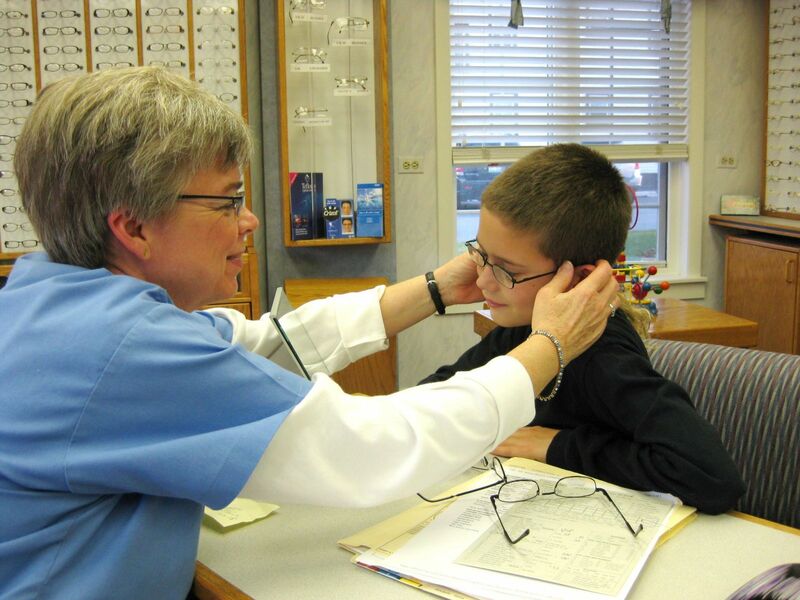 In some cases, bifocals are prescribed for students that have eyestrain while reading. The top enables them to still see the distance, while the bottom has a prescription to reduce eyestrain while reading. Multifocals cost more than single vision lenses because two or more prescriptions are ground into one lens, requiring additional time and skill needed to accurately fabricate, measure and fit these lenses. Great strides in technology have been made with bifocal contact lenses. They work best with those individuals that have never worn glasses, are farsighted and now need reading glasses. They work seamlessly and automatically. In addition, monovision contact lens correction (using one eye for close vision and one for distance) is very common and works well for many patients. Patients are always concerned about their ability of insertion of contacts in the eye. Once shown, they are surprised how easy it is. During the examination, we can determine if either bifocal or monovision contact lenses will work for you and would be happy to discuss all the options available to you. Protects lenses from scratches caused by everyday use. Additional protection from harmful ultraviolet rays of the sun. Polycarbonate and the highest index lenses have built-in UV protection. They enhance your vision and your appearance. Any color can be ordered. Mirror coatings for sunglasses. Blue Blocker and yellow coatings for hunters and daylight driving. Polarized lenses cut the glare and reflections from the sun. These are great for fishing and daylight driving. No-glare lenses provide superior vision. Normally, only 92% of light gets to the eye because of reflections. With the anti-reflective coatings, up to 99% percent of the light reaches the eye. Not only is this coating great cosmetically, but it also enables those with cataracts or macular degeneration to see better at night. Sports goggles that provide the ultimate in eye protection. Not needed for everyone, these glasses are designed to use the top half of the monitor distance and the bottom part for usual reading distances. This removes the need to have to tilt your head back in order to see the monitor through the bifocal. You can still see a fair distance out of the top, not like if you looked out of your reading glasses across the room. Almost a must for those on a computer all day. OCCUPATIONAL GLASSES have a bifocal both on the top and bottom. These are used for people who have to do a lot of close work ABOVE their heads, like electricians, telephone workers, plumbers, or car mechanics. From single vision to invisible multifocals to plain reading to prescription eyewear, we can provide you with special eyewear to fit YOUR lifestyle, all at an affordable price. That's what we do best at Skowron Eye Care.